PORTLAND, OREGON -- When Sam Affolder's arms and legs started "freezing" on him about midway through the boys championship race at Nike Cross Nationals on Saturday, there was a probably a moment when, just for a second or two, he started to panic. After all, it was impossible to ignore the magnitude of the day for Loudoun Valley's (VA) boys team, which was trying to become the first program in NXN history to claim back-to-back titles. Affolder was Purcellville's No. 1, and his team looked at him as the runner who set the tone for the rest of the lineup. But after going out with the nation's best runners in the first mile, his body just didn't respond the way he wanted it to, he said, and he was falling back. And then he saw Saratoga Springs (NY) senior Shea Weilbaker. The two had a history, having raced together in New York during Affolder's freshman season at Carthage. What followed even surprised him. "Shea just told me, 'Come on, you have to go and do this for your team, your team needs you" Affolder remembered. And then just like that, he began to gain back a little bit of control. Then even more came when teammate Carlos Shultz approached Affolder at three miles and implored him to finish hard. The pair did just that, scoring 30th (8 points) and 31st (9) places to help pace Loudoun Valley, which tallied a remarkable 19-second spread and five scorers inside the first 63 places, to score a record 77 points at Glendoveer Golf Course. Great Oak (CA) secured its best finish since its winning year in 2015, earning a second-place bid with 114 points, which was just one point ahead of surprise Dakota Ridge, which got two runners in the top 10 and scored 115 points. Bishop Hendricken (RI) was fourth with 206 and Fayetteville-Manlius was fifth with 209. "It really shows our depth," said senior Jacob Windle, who also had an off day. "Three out of four of us didn't have great days today, and we still did what we came here to do. It shows our team. We bonded together, we know how to pick each other up." Senior Jacob Hunter was 39th, junior Kellen Hasle was 52nd and senior Connor Wells was 63rd. Late in the race, Wells said he heard coaches Marc and Joan Hunter "throwing out random numbers," but chose to remain calm and composed, focused on his own race. "It's hard to truly know where you are in the race, so you have to trust your instincts and know your teammates," he said. Affolder began the race with the leaders, which in the first mile included a pack that went at least seven runners across the width of the course. The senior had felt comfortable and confident this time around, and wanted to redeem himself after placing 23rd in 2017. That ultimately didn't come, though while he didn't get the championship win or the top 10 place he was hoping for, his finish with Shultz ultimately helped bookend a strong 1-2 and made the difference in points. "That's when I got a second wind and a second gear and I kicked in ... and then was in the medical tent after that." Will Loudon Valley return next year to claim a three-peat? That's a question which can't be answered just yet. Three of the team's top five runners, and four of the top seven, will graduate after the spring track and field season -- and three will go on to Division I schools to compete -- which may put into question the strength of the nation's best distance program. But maybe we shouldn't be too quick to count out the Vikings. "That's something [us seniors] will definitely be doing through the rest of this track season, [encouraging the group of returners to get back here again]," Affolder said. "We still have indoor and outdoor. They'll pick up more as us seniors roll. I'm confident these guys will pick up where we left off." Either way, this two year run will not be forgotten. The Vikings no doubt made history in 2017 and 2018. Liam Anderson held a smile with about 1K to go in the boys race on Saturday. The Redwood (CA) High School senior was in a group of three others, alongside Cole Sprout, Easton Allred and Nico Young. But among those four, only Anderson remained completely confident on his ability to close. After surging ahead of Sprout with less than 800 meters to go, Anderson made a big move over the last two big hills and then sprinted to the finish, scoring a meet record time of 14:57.6 to score his first win at NXN after at third-place finish in 2017 and a 22nd-place outing in 2016. "I think ever since last year getting third--I was going for the win last year, too--I think really I ran out of room coming up the last hill," Anderson remembered. "So that's haunted me a little bit the past year and I've been looking forward to today and giving it another go." 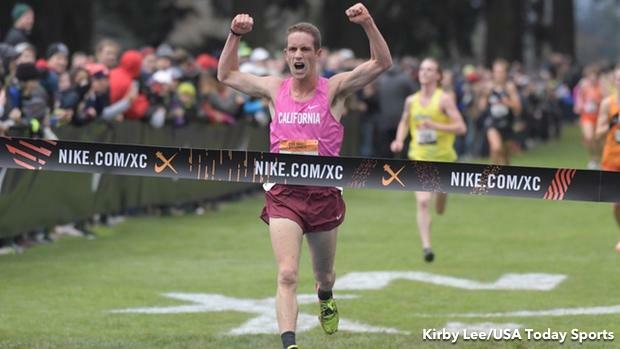 Anderson became the only runner in NXN's history to break 15 minutes, though two runners behind him also broke the old course record. Indianapolis Cathedral (IN) senior Cole Hocker had a memorable finish, too, sprinting past Sprout to claim the race's runner-up finish in 15:00.9. Valor Christian's Sprout was third in 15:02.7. Newbury Park's Young, who held on with the lead pack for almost the entire race, was fourth in 15:04.7 and Mountain Vista's Allred was fifth in 15:05.2. While Anderson's plan was near perfect and reminiscent of his late surge from 2017, Hocker's was just as impressive. The Indiana star was hurting at 4K. "I kept telling myself as long as I stayed hooked on to that front pack--I was 5 meters back-- and as long as I stayed with them--we were getting further and further away from the chase pack--then I could go home and through the finish," he said. More impressive was the fact that this was Hocker's first national cross country race. "I would have obviously liked to win a championship individually, but I can tell you second place is a lot better than last year when I was watching it from my house," he said. Even though Sprout fell to third, he said he was happy overall with the performance, too. "I definitely gave it a least everything I had, and probably pushed more than I should have," he said. "I was happy with how it went." In the case of Anderson, he knew that in a race of this magnitude, it was smart to let others do the early work and simply hold ground. "There's no reason to be doing the work when we don't need to be," he said. "I knew there would be a lot of people up there. This year was one of the deepest fields they had. I wanted to let someone else take that risk and keep myself in position and not let a gap form and bide my form." When the first move of the major pack came from Hersey's Josh Methner, Anderson stayed in pursuit. And then when another came from Allred after the 3K mark, he did the same. "I felt good," he said. "I think for me that last K is where I get to take control a little bit after sitting back the whole race. Going into that and knowing where I was, I was confident in my ability to out kick them."